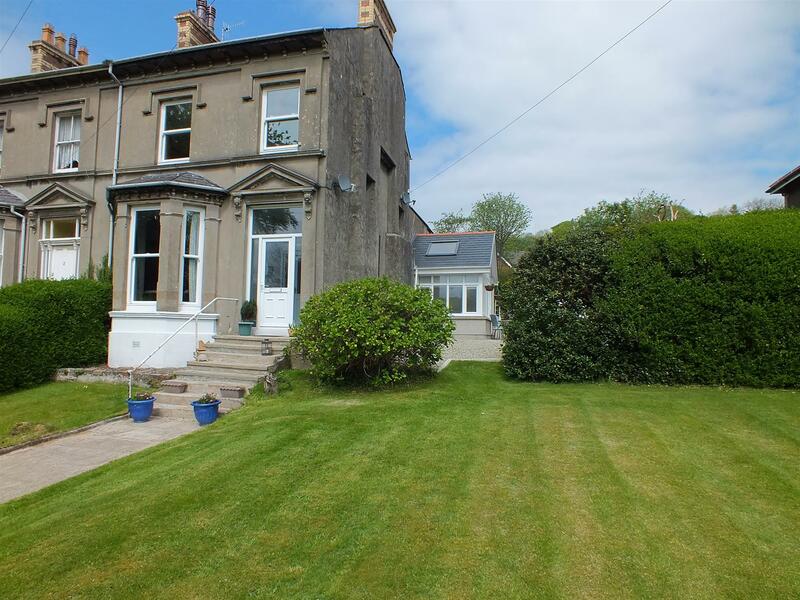 End of Terrace, 4 Bed Victorian Family House with a Large Garden. On the Main Bus Route & Within the Catchment Area for Marown School. Deceptively Spacious Accommodation with a Flexible Layout. Exceptionally Large Lounge, Modern Dining Kitchen & Sun Lounge. Separate Rear Kitchen & Utility Area. Large Ground Floor Shower Room. Open Sitting Area to the First Floor & Large Period Style Family Bathroom. 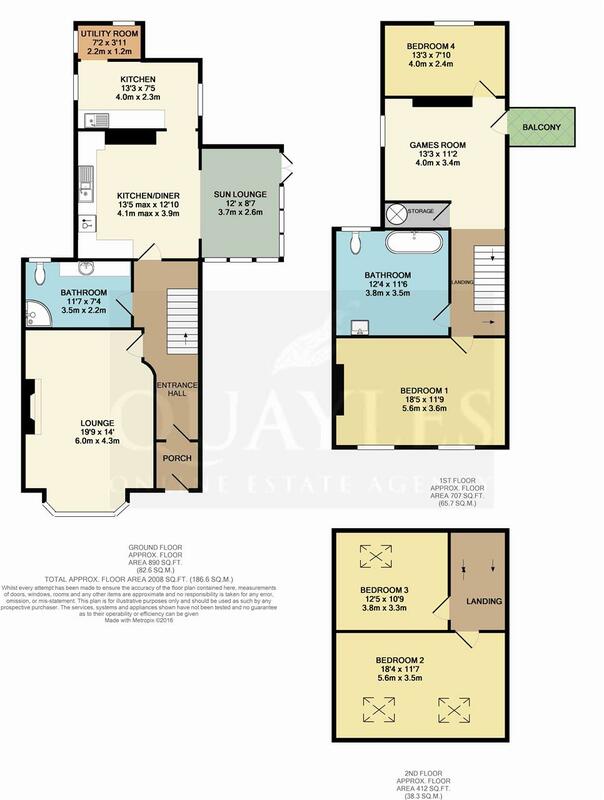 4 Excellent Double Bedrooms Set Over Two Floors. Fire Alarm System. Gas Fired Heating, uPVC Double Glazing & Timber Framed 'Velux' Windows. Generous Gardens to the Front & Side with a Private Patio Area. Off Road Parking for Numerous Cars and Large Single Detached Garage. TT and Grand Prix Access to the Rear of the Property. Travel out of Douglas in a westerly direction along the main Peel Road. Continue through Union Mills, passing the Post Office / Spar shop through to Glen Vine. On entering Crosby, Meadowbank will be found a short distance along on the right hand side with layby parking directly opposite. The property will be clearly identifiable by our photograph and For Sale board. A spacious Victorian end of terrace family house which has been modernised by the current owners to provide a comfortable family home offering many extras including a ground floor shower room and first floor sitting area ideal for teenagers. The property was once divided into two flats and the external staircase and first floor entrance remains, giving potential to re-configure if desired (stpp). In addition, planning permission has been granted in recent years to construct a similar property within the side garden although this has now lapsed. Half glazed uPVC entrance door with matching top and side lights. Original cornice. Part glazed, panelled door to reception hall. Original tiled floor. Coat hooks. Cornice. Staircase to first floor. Combined light and fan. Open area understairs with power points. Wood effect, laminate floor covering. A light and airy room having a shaped bay window with original panelling enjoying distant hill views. Attractive stone fireplace with polished hearth and inset electric fire. Original cornice and picture rail. Television and satellite points. A large room with a white suite comprising WC, wide, built in vanity shelf with inset basin and a corner enclosure with tiling to two sides housing the 'Mira 60' electric shower. Cornice and picture rail. Tiling to mid height. Large uPVC window with stained glass effect design. Wall mounted mirror. Ceramic tiled floor. Fitted with a superb range of cream coloured wall, base and drawer units together with neutral background tiling and laminate work surfaces incorporating a 1 1/4 bowl stainless steel sink with a lever mixer tap. Two glazed display units. Counter lighting. Space for a freestanding 'Range Style' cooker with a brushed steel filter hood over. Integrated dishwasher. Space for a fridge freezer. Plinth heater. Clear opening to the rear kitchen. Wood effect floor covering continues though a wide clear opening to the sun lounge. Ceiling spotlight fitting. A useful area fitted with base units and laminate work surfaces incorporating a single drainer stainless steel sink with splash back tiling. Space for additional freestanding appliances such as a chest freezer / fridge. Windows to either side. Ceiling spotlight fitting. Tiled floor. Clear opening to the utility. Plumbed for washing machine. Vented for dryer. Two uPVC windows. Tiled floor. Constructed approximately 2012 and having a high angled ceiling with two 'Velux' roof lights in addition to uPVC windows fitted with low level blinds and double doors to the side patio. TV and power points. Matching wall and ceiling lights. An open plan area with uPVC window and glazed entrance door with steps leading down to the side of the property. Deep, built in cupboard housing the 'Worcester' gas fired combi boiler, installed approximately 2009. Coat hooks, shelves and light. Four steps to the main landing and door to bedroom 4. A double room located to the rear of the property with a uPVC double glazed window. Ceiling spotlight fitting. Wood effect laminate floor covering. Television point. Stairs continue to the second floor. A wonderfully spacious room with tiling to mid height complementing the classically styled suite of double ended bath with mixer shower attachment and decorative feet, pedestal basin and WC. Recessed shelving. Obscure glazed uPVC window to rear elevation. Coved ceiling and centre spotlight fitting. A full width room with ample space for a super king size bed if required. Two uPVC double glazed sash style windows enjoying distant hill views. Painted, tiled fireplace. Recessed display shelves. Original cornice and picture rail. Television, telephone and satellite points. Double glazed, timber framed 'Velux' window. A double room with a high angled ceiling and open eaves area. Timber framed 'Velux' roof window. Television point. A spacious, full width room with a high angled ceiling and open eaves area - ideal for drawer units etc. Exposed beam with spotlight fitting. Two large, timber framed 'Velux' windows to front. Television point. To front of the property is a large south facing lawned garden with timber entrance gate and mature hedge surround with concrete steps to the front entrance. To the rear is a large concrete hard standing accessed from the rear lane. Water point. A large single with up and over door, pitched roof and timber framed side window and door. An L-Shaped walkway with stone wall boundary which gives access to the side of the rear annexe. Gas metre. Small store area. £154 - For more information please contact the rates department on (01624) 685661.